This Key Biscayne, FL-condo had not been updated since the 1970s when it was built. The cramped and outdated kitchen was not conducive for all of the entertaining that this family from Guatemala wanted to do in their vacation home. 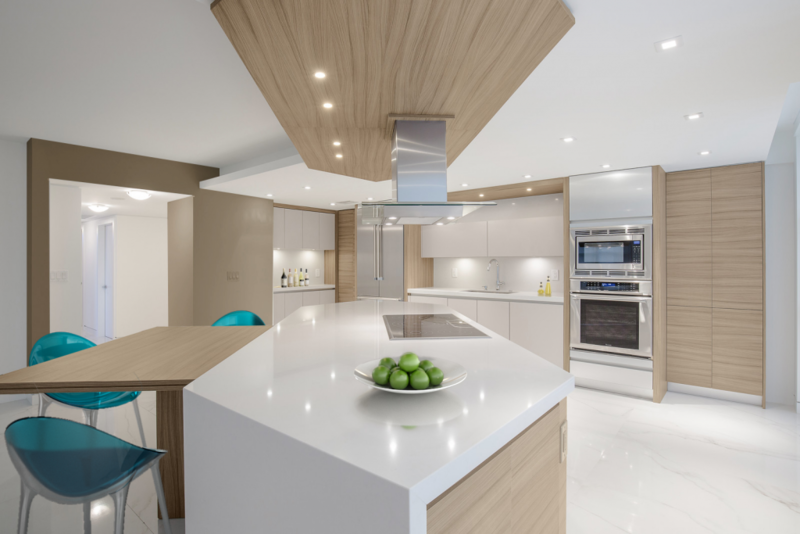 Sandra Diaz-Velasco of Eolo A&I Design in Miami, FL was asked to open up the kitchen to the other rooms in order to accommodate large groups for entertaining. Additionally, the clients asked for another bedroom and bathroom. Diaz-Velasco brought in carpenter Luis Torres and Sanandres Construction to do an entire gut and remodel of the condo. Diaz-Velasco’s main challenge was to preserve a sense of open space while still appropriating a large area for the additional bedroom. After playing around with the geometric shape of the resulting kitchen/family room/living area, one big integrated living and entertainment space was created, including a dining table. To create the illusion of more space, the entrance to the pantry and laundry area were concealed within the kitchen.